Different approaches to training exist and can be used in CPPB training. In our overview of training approaches, we emphasize that each approach has both strengths and drawbacks. Here we draw on the approaches discussed previously and develop the ‘Peace Training Approach’ to CPPB training. This approach takes elicitive, adult learning, experiential and immersive approaches as starting points and then explores how to build further on other approaches to develop an integrated, evidence-based and practical approach to developing and improving performance capabilities and operational competence for personnel deployed in the field. We take a holistic perspective in defining the Peace Training Approach (PTA) by looking at different aspects of a training, including the methods, trainer-trainee interactions, the environment of the training and more. 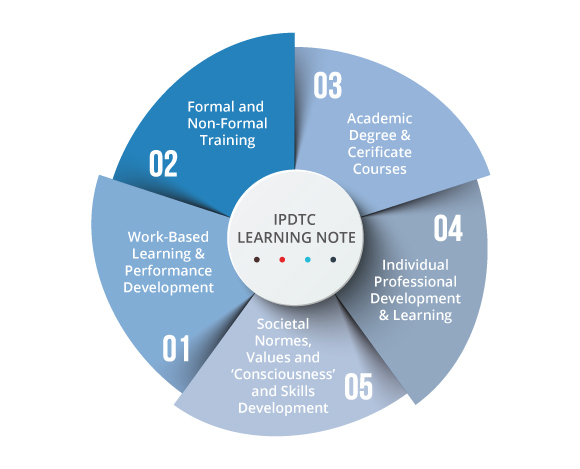 While the PTA is not necessarily a conceptually unique learning approach, its value lies specifically in the concrete guidelines it offers training and training organizations. The insights offered demonstrate how to apply PTA in practice addressing the specificities of CPPB as a field. This is important. Many training and learning approaches are developed outside of the CPPB field. While they may provide interesting references and sources of inspiration and learning for CPPB training, it is important to also identify a framework of approaches which meets the specific needs, learning objectives and requirements of the CPPB field. These should relate to an overall CPPB Competency & Curricula Framework and Professional Practice Model. The Peace Training Approach takes steps towards addressing this. This will be further refined and developed for V2 of the Handbook. To this end, we invite you as readers, practitioners, professionals, trainers and stakeholders in the field to share your experiences and insights on peace training here! 1. The Peace Training Approach: Why? The contexts in which personnel trained are deployed are often high-stress, dynamic, fluid and conflictual, with a broad ecosystem of stakeholders and actors involved all of whom may have their own methods, approaches and agendas. PeaceTraining.eu studies have found that while many trainings in the CPPB field focus extensively on knowledge (e.g. legal frameworks, organizational procedures, peacebuilding principles), less attention is often devoted to core CPPB skills-training (e.g. how to do peacebuilding in practice, how to facilitate community-based reconciliation and healing, how to do mediation and peacemaking, support practically local ownership and empowerment, mainstream gender and more). In fact, it is astonishing how little training in Europe (and internationally) today properly prepares participants with core CPPB skills and capabilities. To effectively prepare CPPB practitioners for their tasks, additional attention should hence be devoted to the development of CPPB skills and competencies to a level needed for effective performance and impact in the field. This means that the approach used in CPPB trainings needs to achieve not only knowledge development but also skills and attitudes. It can also not be limited to only one specific set of competencies but needs to address the necessary breadth of competencies required for effective CPPB performance in the field. The approach taken to training should thus address this tripartite of developing appropriate attitudes for CPPB together with the knowledge and skills to perform one’s CPPB task. This insight promotes the use of adult learning, elicitive approaches, and experiential learning to training as these target different competencies, while solely prescriptive approaches are often limited to the transfer of knowledge. The three former approaches are associated with collaborative or participatory learning methods. The PTA takes a holistic perspective on training and the training process. This means that a PTA addresses the integrated elements of a training, including content, training methods, the training environment and more. The figure below provides and overview of the 10 components of the PTA. Click on each of the components for further guidance on peace training design! A PeaceTraining.eu approach to training recognizes the value of single training moments, but also acknowledges their potential limitations. A single training moment, no matter how well conducted, is only one part of the necessary competence development in the CPPB field. They should hence not be seen as a solution to all capacity-related problems. This requires re-valuing training as a process, or a continuous cycle, with space for re-training or sequenced training, on the job training, and coaching. A PeaceTraining.eu approach at the level of the training organization will more likely follow the first conceptualization of comprehensive training, while deployment and practitioner organizations themselves are recommended to follow the second understanding. In the discussion of the other components of the PT-approach, we mostly focus on the perspective of training organizations and individual trainers in the classic single training moments prevalent in the field today. The physical environment of the training should aim to put participants at ease. The room set up, music, lighting, refreshments, room temperature etc. can all make participants feel welcome and comfortable. Where possible, the room set up should promote openness and inclusion. For instance, a circle or semi-circle can promote equality and open discussion, while a setting with rows and the trainer at the front often promotes hierarchy and makes conversation difficult. Tables for group work can enable participants to easily move into breakout groups. Moreover, facilitators can arrange the room walls with the results of participants’ work to show appreciation for their contributions. Through these measures, the environment can stimulate interaction, collaboration, openness and respect. Trainers should be respectful of participants, accepting, and supportive (e.g. being open to individual consultation when problem arises). A trainer or coach is available for extensive periods of time during the training or all throughout the training (e.g. there is a constant factor in the trainer, which is especially important if various guests or Subject Matter Experts are invited to a training and many person changes occur). An accepting, supportive and respectful environment is crucial for ensuring group cohesion and the comfort of individual participants. Sensitivity to culture, conflict, gender and power dynamics amongst participants throughout the training can help promote equality while simultaneously valuing diversity. Trainers are aware of the possibility of re-traumatisation through content or the certain use of training method. How this atmosphere is created is further described in ‘Laying the Groundwork’ and ‘Communication’ sections. Respectful communication is also essential for creating a safe psychological environment. Trainers can promote respectful communication throughout discussion and model values of empathy, respect and being non-judgemental. They can promote equal power dynamics by ensuring that no one dominates the discussion and encouraging quieter people to speak. The trainer can facilitate learning by stimulating reflection and dialogue, using open-ended questions. Trainers display sensitivity through challenging any discriminatory behaviour or comments. Problematic and challenging topics should not be avoided but given the space for discussion. Furthermore, materials used should be representative of diverse perspectives and promote understanding and empathy (e.g. for different cultures, marginalised populations). The trainer directs the training process and ensures that participants are involved in the planning, debriefing and evaluation. During the planning phase, a trainer may choose to liaise with participants in advance of the training if necessary to gather information about their backgrounds and training needs. In addition, she/he plans and executes the agenda, ensuring that learning objectives and methods are appropriate for the participants. A trainer sets the tone for a training through promoting values of equality, respectful communication, and respect for diversity. In order to effectively accomplish this, self-reflexivity and awareness of one’s own biases is important. Such awareness can allow the trainer to model the values put forth in the training and mentor participants. While trainers may monitor time and keep the agenda moving, she/he is also sensitive and responsive to group dynamics and participants’ needs. Such responsiveness requires careful facilitation (e.g. the use of a ‘car park’ technique). Respecting knowledge and experience of participants is crucial for participant engagement, and trainings can be enriched through providing opportunities for participants to work together and learn from each other. When a trainer invites Subject Matter Experts (SMEs) to share their expertise, it is the trainer’s responsibility to ensure that the SMEs fits the learning objectives and appropriately integrates their materials into the training. Participants should have ownership and agency in the training process. Ownership can be achieved through consulting with participants in advance, being responsive to participants needs during the training, respecting the knowledge that participants bring to the training, and gaining feedback where necessary. Participants can make each training unique because they bring knowledge and experience to the training. The critical engagement among participants and between participants and the trainer promotes agency within learning. The diversity of participants can be another critical aspect of learning within the group, so a training can benefit from discussion of difference and sensitivity to diversity. Trainers, training organiser, and SMEs are aware of the specific nature of CPPB. This includes having attention for diversity in the CPPB field, as well as the training context, and being aware of the potentially high-risk nature of CPPB practice. For more guidance on including the 5 sensitivities in the training process, please visit the 5 Sensitivities page. The trainer has expertise in using multiple techniques with different and diverse audiences. The methods are used appropriately to accomplish particular learning goals, and the type of competency covered (knowledge, attitudes, skills). There is sufficient variation in the use of methods to accommodate different learning styles and participants’ attention spans/energy levels. Reflection helps to consolidate learning, as it helps participants think about how a training activity may apply to their own lives and work. Reflection can be especially beneficial in transforming attitudes, as it can generate self-awareness and raise consciousness. Reflection can occur in large or small groups, in pairs, or individually. Usually, participants are prompted by a series of open-ended questions designed to stimulate thinking. While reflection stimulates participants’ learning, reflection is also needed to evaluate the course. This can be part of participants’ reflection process, but also the trainer’s! Training generally includes 6 phases: needs assessment, training design, delivery and implementation, assessment, evaluation and learning, and utilisation – or implementation of the training results. During the preparation phase, the needs the training should address are identified. The content and learning objectives are developed, and the course structure and methods are designed. At this point, the course developer may work closely with field staff to identify necessary competencies and meet with participants to assess their level and training needs. 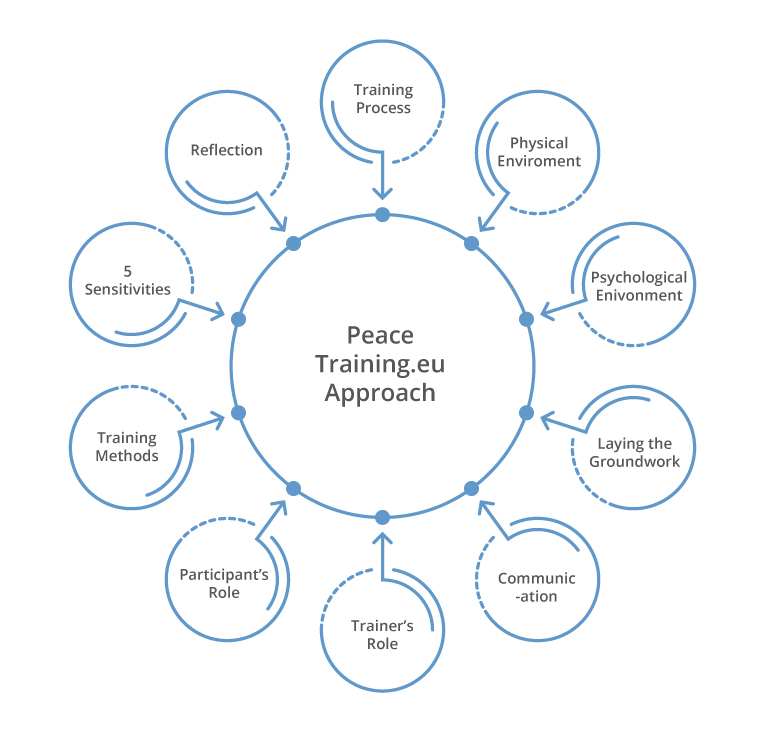 The Peace Training Curricula Design Process provides a step-by-step guide to how this can be done. The Peace Training Approach emphasises the importance of properly implemented needs assessments, together with the broader need for a Competency and Curricula Framework for the field. These are important to ensure training matches the needs in the field and both i. builds on competencies of participants; and ii. ensures participants have the competencies and performance capabilities needed for the field. Implementation and delivery of a training involves creating a safe environment for collaborative learning and ensuring appropriate methods. Evaluation and learning involves reflection from the training team – as well as other stakeholders who can be engaged on this process – on the i. the effectiveness of the training, what went well, what can be improved; and ii. how to then implement what is learned in the evaluation in future trainings. It can utilise data from participants regarding their change in knowledge or attitude and requires personal reflection from the training team. The planning and follow-up of these stages forms one part of a comprehensive training process. Importantly – assessment of participants can take place both in or during the training as well as in-field / in-deployment later. Today there are very few training and performance development systems in which competencies addressed in training are later assessed in performance evaluations and reviews or field-based testing. This is one area that could be improved to strengthen the link between training and performance in the field. Another instrument is the use of ex-post evaluations by participations some months to some years after trainings, in which participants may also engage in self-assessment and reflection. A comprehensive approach to capacity building in the field also recognizes that professional development and performance improvement are not necessarily limited to one moment (e.g. a single training of 2 days, 1 week, 1 month). It is a life-long process that should be closely integrated in practitioners’ deployment and engagement in the field. In this context, individual trainings need to be continuously evaluated to ensure they are best serving practitioners, policy makers and the CPPB field as a whole. Also, participants may require retraining or next level training (sequenced or layered approaches) to keep up with advancements in the field and changes to practice. Retraining training and further can also provide an opportunity for participants to refresh knowledge, practice skills, and reflect on issues from different places in their careers. The Peace Training Approach, while emphasizing the critical importance of each training and the need to ensure that every training in the field is designed, developed and implemented with proper attention to good practice and strengthening participants capabilities for the field, also recognises clearly that training and any single training are not enough. Training should be one element of a comprehensive approach to capacity building and professional development in the field. The Peace Training Handbook engages primarily with 2 of these: Formal and Non-Formal Training and Work-Based Learning and Performance Development. While the capacity building approaches for individual practitioners and policy makers which is the principal focus addressed in CPPB training is also the primary focus of the Peace Training Handbook, the Handbook and Peace Training Approach also recognise the need for the development of a comprehensive approach to capacity building and improving capabilities in the field – from individual practitioners to organisations, sectors, and the CPPB field as a whole. The Peace Training Approach: Why?